"He is being monitored (by colleges) without question," says Steve Clarkson, that quarterback mentor who "discovered" young Sills a couple of years ago. Maybe more than monitored. David's father, David Sills IV, said the family received a questionnaire from UCLA. That was a year ago. They discarded it. It might have been a mass mailing for a camp. Maybe Rick Neuheisel was that desperate for quarterback help. Who knows? 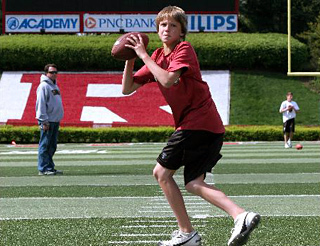 Clarkson raves about Kelly Hilinski, a 6-4, 14-year-old eighth-grader from Claremont, Calif., whose academics are so strong he was invited to the Presidential Youth Inaugural Conference. His bio proclaims Hilinski might be "the first surgeon in history to spend his Sundays … as a quarterback in the NFL." Like Sills, Hilinski has received correspondence from UCLA. "I think they just wanted to say hi," Kim Hilinski said of her son. Neuheisel might not be aware he has an advantage. Members of the family are already big Bruins fans. Doctors at UCLA replaced a defective aortic valve in Marc Hilinski, Kelly's father, with a bovine valve. I got to give it up to Rick, his coaching might be suspect IMO, but the man is a relentless recruiter. I know that might come off sarcastically, but the ethics of recruiting pre-high schoolers aside, this guy is no joke. As for Sills, I think it's sad that kids his age are getting this type of attention and hype (pressure), but it really is inevitable that this becomes the trend until the NCAA steps in and puts the clamps down. My hope is the kid doesn't spiral out of control a la Todd Marinovich.